We are Carpet Cleaning and Duct cleaning experts Serving Langley, Abbotsford, Mission, Chilliwack BC. Everyone deserves a good looking and high-quality carpet. It is an important part that completes the look of your house and is also responsible for providing comfort and warmth under your foot. Whenever possible, go for the highest quality carpet that can you afford. But even the best carpets in the world go through some rough treatment. It can be easily marred by Children, pets, dirt from outside, stains and general wear. The life of the carpet is severely affected by these factors and it will affect the whole look and feel of the room. There’s some good news, though. Do you know, a properly maintained carpet can easily last for many years without any problems? If you cherish your carpets and increase its life then consider our carpet cleaning services right here in Abbotsford. With over 15 years of experience in cleaning carpets and ducts, we have gained plenty of knowledge on how to deal with even the dirtiest of carpets. Carpet cleaning is an art and science and we have mastered the skills to provide exceptional carpet cleaning services to our customers. Our objective is to provide you with services that surpass your expectations. We use the best cleaning machines in the industry to clean our customer’s carpets, leaving them spotless and clean right to the threads. We use hot water extraction system for cleaning which is a compulsory requirement for some newer carpets. And not just the best machines, we also employ the best talent to complete your cleaning job. We invest plenty of time on our employees to provide them with quality education and training so that professional level services can be enjoyed by each of our customers. Protect your family's health by creating a regular maintenance program that fits easily into your household needs, and budget. We provide excellent carpet cleaning services but we also understand that for a clean and healthy home, you need more than just carpet cleaning. That’s why we offer many other cleaning services like duct cleaning, upholstery cleaning, furnace cleaning, vents cleaning and much more. 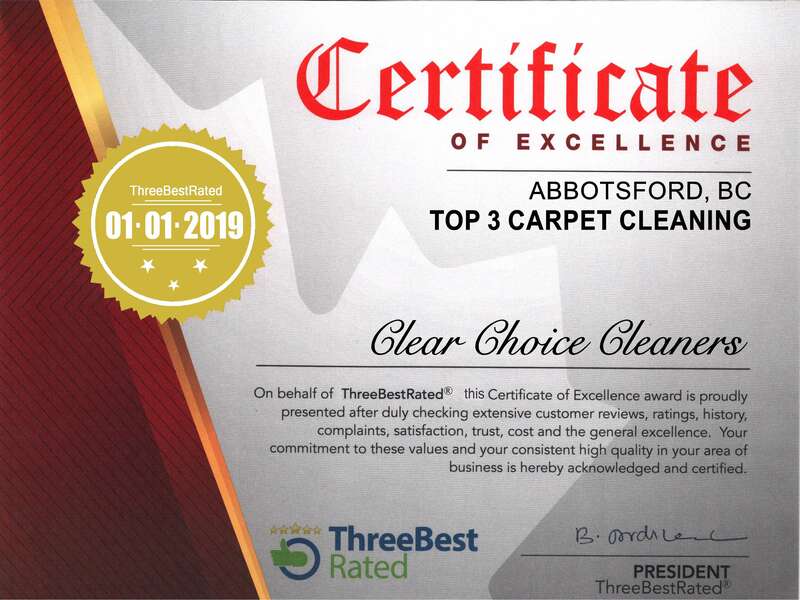 Clear Choice Cleaners is a carpet cleaning and duct cleaning company in the Abbotsford area that also services the Chilliwack, Langley and Mission areas. We provide an excellent carpet cleaning experience that will leave you referring our Carpet and Duct cleaning services to your family and friends.